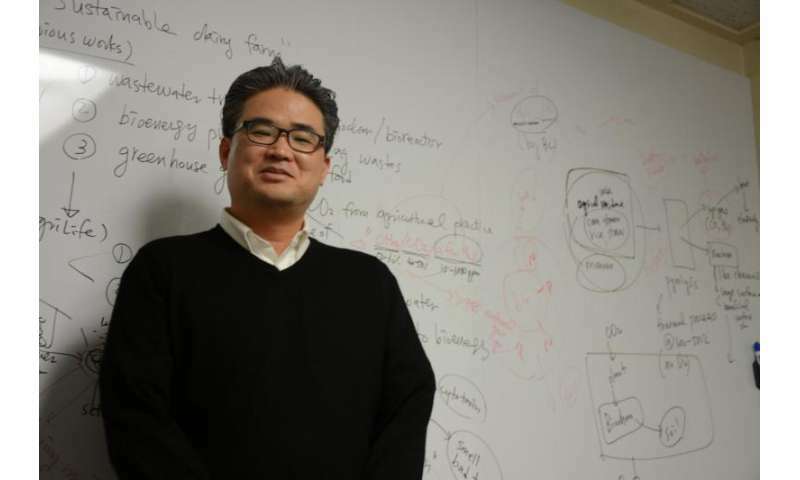 Dr. Eunsung Kan sees his concept of a closed-loop dairy farm, which reuses wastewater, emits zero waste and powers itself on manure, as the future of sustainable animal farming. Kan's research would utilize existing technology – biochar, a carbon material similar to charcoal, created from animal manure and agricultural waste, such as corn stubble or rice straw – that would be used to filter solid waste and effluent. The biochar could be used as a slow-release fertilizer or converted, via pyrolysis, which is the decomposition of organic material by heat, into energy to power the farm. "The mission is the treatment and reuse of dairy wastewater and the conversion of dairy waste into energy to power the facility," he said. "It focuses on providing a model for sustainable farming." Last year, Kan received a $1 million grant from the Texas A&M University Chancellor's Research Initiative Fund to research the viability of the closed-loop dairy system. Before joining AgriLife Research, he also received about $400,000 in research grants from the Environmental Protection Agency, U.S. Department of Agriculture and U.S. Geologic Survey to research the concept's potential to treat animal waste, control greenhouse gas emissions and convert manure to energy. "The affluent from the column would then be very low in nitrogen and phosphorous," he said. "If we filter to low levels of nitrogen and phosphorus it wouldn't cause any environmental problem." For instance, Kan's study has shown that a biochar immobilized with photocatalysts completely degraded antibiotic and hormone compounds while effectively controlling pathogens. The potential for biochar's use to filter wastewater goes beyond agriculture and could be applied at any wastewater treatment plant, or even to filter contaminants in injection water used in the petroleum industry for fracking. "The principle is very simple," Kan said. "The dairy would just need a different size reactor to meet its scale of manure output and energy needs." "Having the dairy farm here provides a good opportunity for field data," he said. "The field demonstrations will help us work out any problems that might arise at the various scales that might be applied by commercial animal farms." Clay Dameron, the dairy's waste manager, said between 300-400 cows are milked daily. Those cows produce manure and effluent that is treated via a conventional lagoon system. Around 90-130 tons of solids are moved to nearby croplands and pastures every three weeks where it's used as fertilizer. Treated liquids from the lagoon are dispersed via sprinklers in nearby fields. "It is very exciting," he said. "I look forward to working with my collaborators and colleagues to make this concept a reality that could change the way dairies operate by providing a self-sustaining, environmentally friendly model."